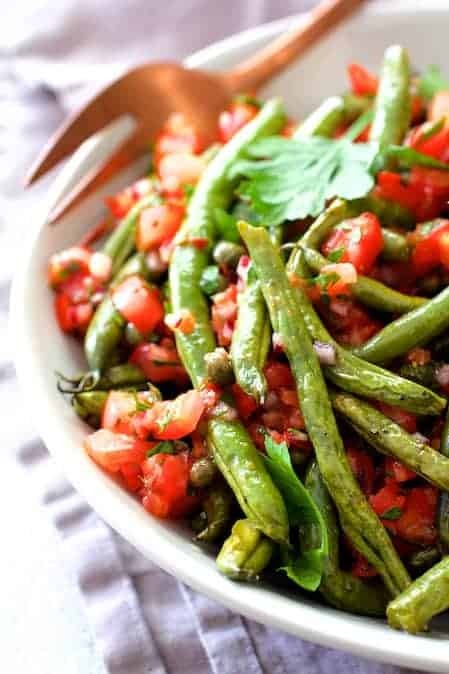 Roasted Green Beans with Tomato Caper Relish is a combination of two of summer’s best veggies creating a beautiful, elegant yet easy flavor-packed side dish! I have a love/hate relationship with green beans. I love green beans when they’re prepared properly and I despise them when not prepared properly. This… coming from a person who has yet to meet a vegetable she doesn’t like. Slowly braised with bacon and splashed with a little vinegar gets my heart pitter-pattering! Frozen and then heated? Never ever. Roasted–like these green beans–with a sweet and tangy tomato and caper relish? Oh yeah! The green beans you see here were lovingly grown by my husband, David. We can’t grow too many things in our Southern garden, but we’re always blessed with a bumper crop of green beans. Squirrels attack our tomatoes, raccoons eat our eggplant and squash vine borers take our zucchini and yellow squash down. It’s a constant battle but the critters seem to leave our green beans alone. Perhaps the critters are also picky about how they like their green beans cooked? Our green beans do so well that by the end of July, I’m wracking my brain trying to come up with new and creative things to do with them. Roasted Green Beans with Tomato Caper Relish is going into our summer green bean rotation from now on! Now, simply roasted with olive oil, salt and black pepper will yield a really lovely vegetable side dish. 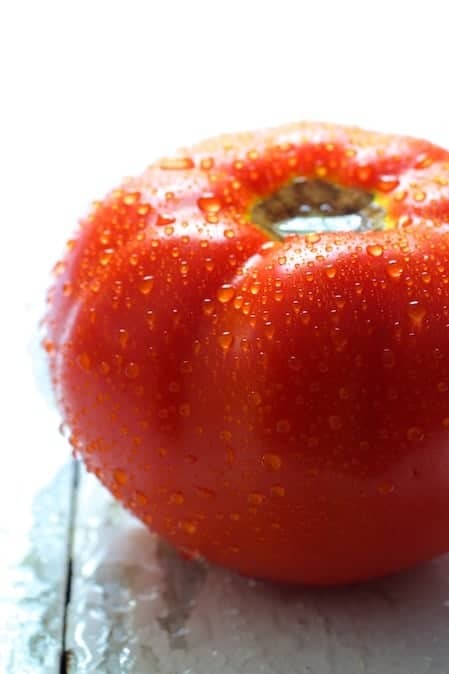 However, this slightly sweet, slightly tangy relish that starts with a big, juicy, ripe, fresh summer tomato is the perfect accompaniment. 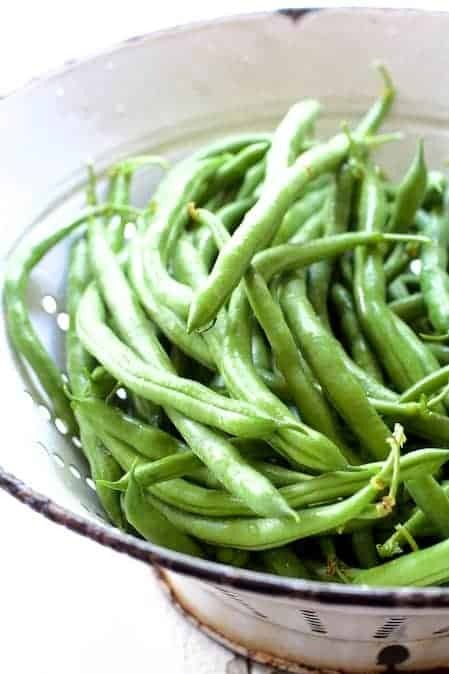 Add capers, red wine vinegar, a touch of honey, some fruity olive oil, red onion, garlic, salt and pepper to elevate green beans to a side dish worthy of your next dinner party! If you’ve never tried capers, you’re in for a treat! Capers are actually little pickled flower buds that pack an amazing flavor punch! Here’s more information from Bon Appetit: What Are Capers, Anyways? Serve alongside simply grilled meat, poultry or fish. Lovely! Not to mention it’s low-carb and gluten-free! 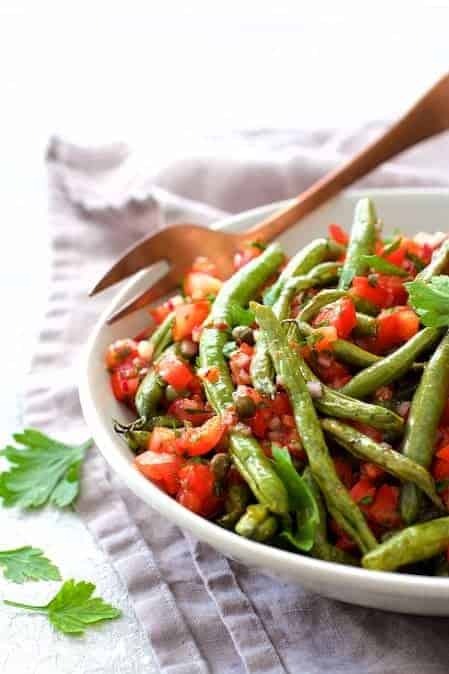 Roasted Green Beans with Tomato Caper Relish is a combination of two of summer's best veggies creating a beautiful, elegant yet easy flavor-packed side dish! 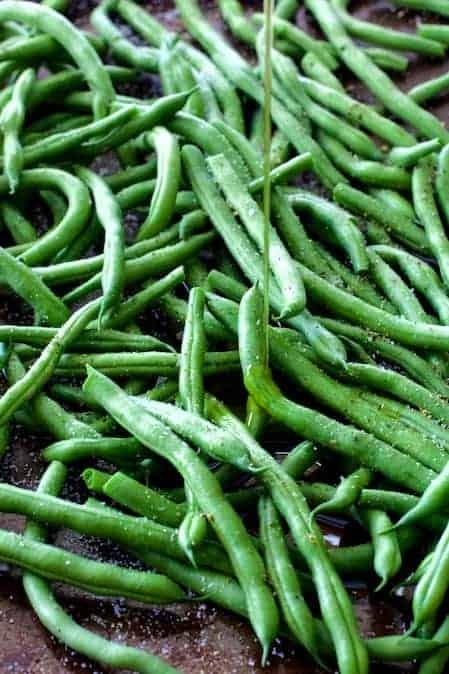 GREEN BEANS: Preheat oven to 375 degrees. 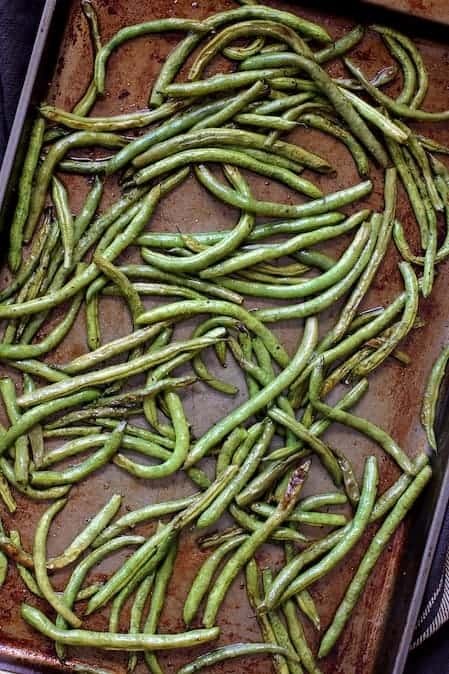 Place green beans on a nonstick baking sheet or on a baking sheet lined with nonstick aluminum foil. Drizzle green beans with olive oil and toss to coat. Season to taste with salt and black pepper. Roast for 15-20 minutes or until almost tender and lightly browned in places. RELISH: While beans are roasting, prepare the relish. 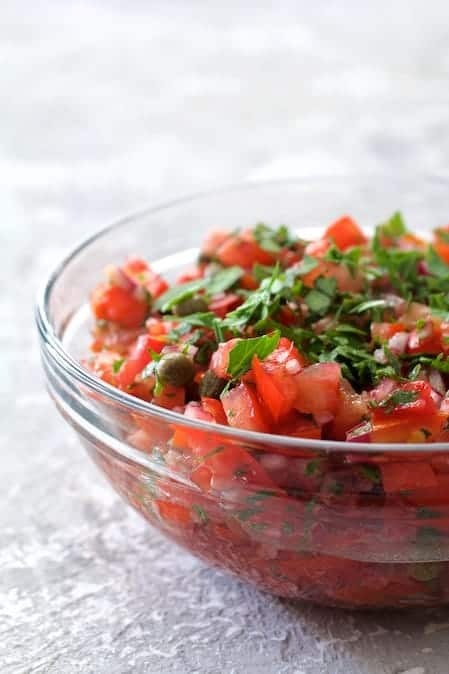 Combine all relish ingredients in a small bowl. TO SERVE: Place beans in a serving bowl and top with relish. Serve immediately. Ooh, I can’t wait for my green beans to come in so I can try this! Yum! 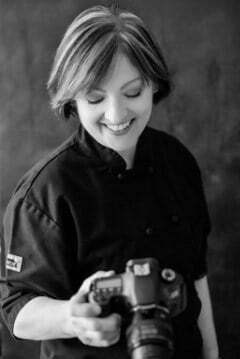 Hi, Melissa, Thanks so much and hope you enjoy!